The All Blacks are focused on the task in hand this week, but stress they are not purely motivated by revenge. 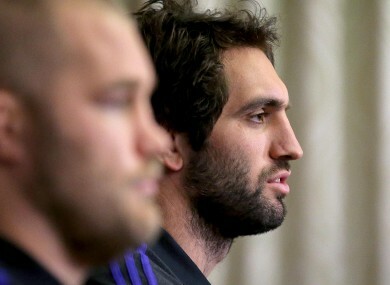 Franks and Whitelock speaking to the media yesterday. HOW DO YOU know the All Blacks are in town? If the unmistakable Adidas-branded bus wasn’t a giveaway, then the travelling entourage of management, support staff, media and general hangers-on most certainly would. What the hotel’s residents trying to savour a morning coffee in the lobby or the locals who had arrived for their weekly facial treatment made of it all is questionable. A lot of commotion, much ado about nothing if truth be told. The Castleknock Hotel, tucked away in its own pocket of tranquility west of Dublin city centre, is used to hosting sports teams — but when the All Black circus arrives, it is the only show in town. Two of the hotel’s downstairs functions rooms have been taken over; one to store equipment and the other to house team meetings and media events. ‘All Blacks personnel only,’ reads a sign in the reception area. It was inside the Hawthorn Suite yesterday morning where Steve Hansen and his coaches sat down with the players to pick their way through the performance from Chicago. It would have been an uncomfortable session for many. Having arrived in Dublin on Sunday, the squad had a light gym session before taking time to contact family and friends back home as news filtered through of the earthquakes which struck New Zealand. Thankfully, none of the travelling party’s loved ones were in immediate danger so the focus reverted back to the task in hand; exacting revenge for that chastening defeat at the hands of Ireland in Chicago. But the party line from the camp is that this is not a revenge mission. Granted, an overall sense of disappointment would have intruded on the dressing room but the players don’t buy into that narrative. Whitelock, the more engaging and forthcoming of the two, added: “When you go out there and don’t perform, individually or collectively as a team, the next opportunity you want to get out there and improve on and that’s what we’re focusing on at the moment is getting better every week. “I thought the guys played really well last weekend [v Italy] and took steps in the right direction but we just have to do that again this week. Before Monday’s media session, the first of the week, got underway, the All Blacks squad filtered out of the function room in dribs and drabs; forwards with forwards, backs with backs, and then Hansen — the newly-crowned Coach of the Year — followed. After he watched his side bounce back from a first defeat in over a year with a typically ruthless and emphatic win over Italy at the weekend, Hansen is now plotting a game plan to subdue Ireland at the Aviva Stadium and, in his mind anyway, restore order to proceedings. Armed with a notepad, Hansen would have led and directed New Zealand’s review meeting with the assistance of his deputies and senior players. Several areas of improvement would have been identified, most notably the line-out which Ireland clinically, and crucially, exploited in Chicago. Whitelock, whose return could be a major boost for the world champions in that department, wasn’t giving too much away but admits they need to up their game in Dublin. “Steve drives the reviews but the whole squad has to be honest first of all with themselves and their performance,” he explained. “It’s a good way to be I think because we get the most learning and growth. “There’s always that detail, we’re always trying to improve individually and as a team so if you’re making the same mistake over and over again he’ll either tip you on the shoulder and have a quiet word or one of the players will do it. Franks, who started the Test match two weeks ago, added: “I think in any high-performance environment where you’ve got a whole heap of guys who want to be the best they can it’s always going to be a critical review whether you’ve lost or you don’t think you’ve played your best. We’re used to criticism and the finger pointed at you so to speak. In many ways, New Zealand were architects of their own downfall in America as they made a string of uncharacteristic errors and allowed Ireland to stamp their authority on the game. Schmidt and his players have already conceded that they will face an entirely different proposition when the sides renew battle lines on Saturday, although neither All Black believes there is now more pressure on Ireland to back up their performance with another one on home soil. “We expect Ireland to perform really well like they did last time, especially at home with a big Irish crowd. They’re always going to be really good,” Franks continued. “I guess they’ve got their monkey off the back and for them the ultimate would be to back it up and that’s the sign of a really good time and there’s pressure on us to perform better. There’s always pressure but that’s what you play for. The last time the All Blacks suffered back-to-back defeats to the same opponent was in 2009 when South Africa claimed consecutive victories in Bloemfontein, Durban and Hamilton. Email “'It's just really fortunate for us after the last performance that we get another shot'”. Feedback on “'It's just really fortunate for us after the last performance that we get another shot'”.